“I agree with Pat Metheny” sang Richard Thompson on one of his most acerbic songs in a career stock-full of them, reflecting on the jazz guitarist’s entirely reasonable disdain for Kenny G. And indeed few would argue with Metheny’s sense of abject horror at the G-Man’s abhorrent decision to overdub his queasily smooth stylings onto a classic recording by Louis Armstrong – arguably the most important single figure in the whole history of jazz. 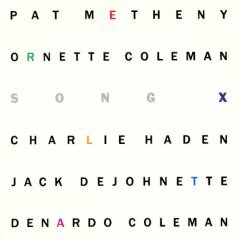 It’s fair to say, however, that Metheny enjoyed rather less in the way of contemporaneous support for Song X, his mid ‘80s collaboration with Ornette Coleman. Recorded over three days at New York’s legendary Power Station studios, Song X marked a radical detour by Metheny – hitherto a fairly mainstream jazz figure with an obvious gift for melody and relatively conventional compositional structures – into free music. Demonstrating an admirable desire to shake things up and explore a more spontaneous approach to music-making, it seems unlikely that Song X was what Metheny’s major label, Geffen, had in mind for his next career move. A little context is required to understand quite how much of a shock Song X constituted upon its original release in 1986 (an expanded version, with six additional tracks, was released to mark the album’s 20th anniversary). Throughout the late ‘70s and early ‘80s, Metheny had pursued a kind of jazz that – somewhat ingeniously, it now seems – managed to merge the more song-like structures of contemporary pop/rock with the instrumental rigour of jazz, without descending into the over-indulgent fusion tropes of the day. First recording for ECM before moving across to Geffen, Metheny cut a series of classic albums – both as a solo artist and with the Pat Metheny Group – that remain formidable entrees into the wider world of jazz, such as Bright Size Life (with the extraordinary Jaco Pastorius on bass), As Falls Wichita, So Falls Wichita Falls, and Offramp. But although Metheny and his fine accomplices, notably keyboardist Lyle Mays, demonstrated plenty of adventurousness on most of these early albums, there was nothing that quite prepared people for the lung-blistering delights of Song X. Then again, this was his first full collaboration with Ornette Coleman, a towering figure in the development of jazz who had been at the forefront of the free movement since the 1960s. Although he did embrace more accessible rock and funk stylings over the years, Coleman’s continued commitment to harmonies and structures that were generally more unusual and unstructured than those found in the jazz mainstream ensured that his status as a genuine pioneer remained undiminished. Like many of the other free jazz greats (Peter Brotzmann being another notable example), he also remained admirably enthusiastic about encouraging, and working with, younger musicians – as a result of which free music is in a more buoyant state in 2018 than many other jazz sub-genres. The two distinct spaces occupied by Metheny and Coleman merge to remarkable effect throughout Song X. Metheny’s guitar-synth (which can outstay its welcome on some other releases) here provides an ideal foundation for Coleman’s boisterous, boppy soloing – and make no mistake, Coleman is the star of the show. Already in his mid ‘50s at the time of the recording, Coleman’s playing is some of his fieriest for many years – his enthusiasm emboldened, perhaps, by a fantastic band that includes double bassist Charlie Haden and drummers Jack DeJohnette and Denardo Coleman (Ornette’s son) alongside Metheny. Critical and public reaction to Song X upon its original release was decidedly mixed, but the album has seemed evermore resonant with the passing years, and can now be seen as one of the most suitable entry-points into free music for the uninitiated. It also left a permanent mark on Metheny, who – whilst not entirely leaving behind the more accessible approach of his earlier music – would become increasingly bold as his career progressed, recording the noise-guitar blowout Zero Tolerance for Silence in the mid ‘90s and, more recently, forming the brilliantly adventurous Unity Band with players including saxophonist Chris Potter (whose 2001 landmark release, Gratitude, will be the subject of a future posting by The Uneasy Listener). The comedian Stewart Lee is fond of referring to his increasing interest in free jazz over the years, despite not being entirely sure that he actually likes the music – and it’s possible that many listeners hold such conflicting feelings in balance, since it’s a music that will infuriate like no other if one is in the ‘wrong’ frame of mind. Against that there are times when its open-minded exclamations of energy and expression can be utterly compelling and put the listener into a state where deeper reflections and revelations are suddenly – and thrillingly – possible. It’s a music that has lost none of its ability to surprise and shock nearly 50 years after the first free jazz milestone recordings, and that alone should be reason enough to encourage the more adventurous listener to dive in. Song X really is as good a place to start as any.